The Thames Valley Trail is over 110 km connecting the Elgin Trail and the Avon Trail from Delaware, through London to St. Mary’s. The Trail Guidebook provides natural, historical, and cultural background information on the Thames River Valley and the Thames Valley Trail Association, in addition to maps, directions, and practical advice for hiking the Thames Valley Trail. The Thames Valley Trail is a 110 kilometer hiking trail which follows the Thames and North Thames Rivers along most of the route. 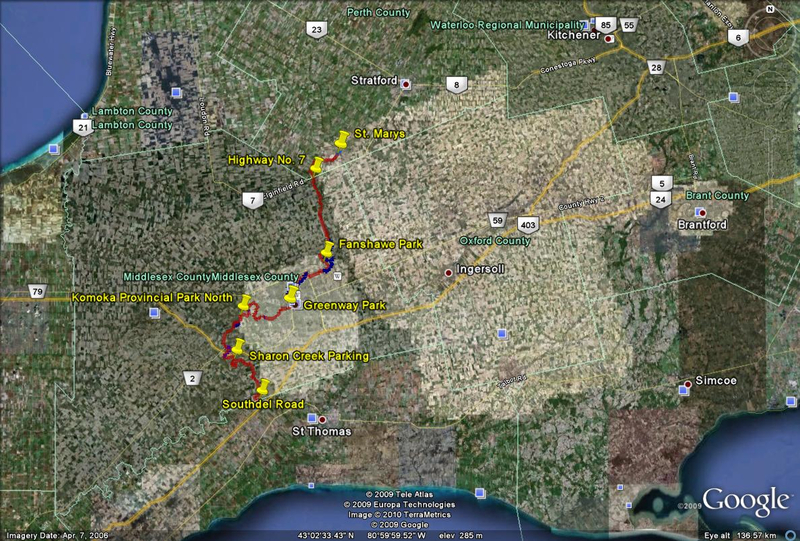 It links the Elgin Trail at the Elgin/Middlesex County line in the south with the Avon Trail in St. Marys in the north. The southern portion passes through farmland on a flat clay plain before joining the Thames River south of Delaware. Through London, the trail follows a multi-use pathway much of the way and continues along the North Thames River. 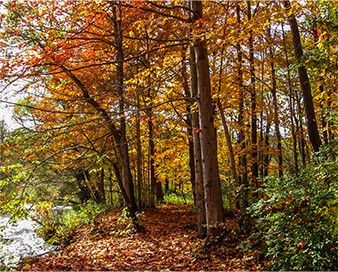 North of London the trail traverses the Fanshawe Conservation Area operated by the Upper Thames River Conservation Authority. North of the Conservation Area the river cuts a deeper valley, and the trail offers excellent views of this valley at several elevated locations. Because some of the trail is on floodplain, flooding can be hazard, especially in early spring and late fall. As well as the main trail, several loop trails are described in the guidebook. These 26 km of loop trails connect with the main trail and provide hikers the opportunity to return to their starting point without having to retrace their steps. About one-third of the Thames Valley Trail is on private land. Public spirited landowners are asked to give permission for people to walk through their property. This permission may be withdrawn at any time if the landowners feel that their property or generosity is being misused. Clearly, the establishment and continued existence of the trail depends upon the users respecting the property of the individual landowners. The main trail is marked at regular intervals by white rectangular blazes, 15 cm high x 5 cm wide which are painted on trees, fence posts, utility poles and other suitable objects. A double blaze (two marks in parallel, one lower than the other) indicates a turn. If the upper mark is slightly offset to the left, the turn is to the left and if it is offset to the right, the trail makes a turn to the right. Normally the next blaze can be seen from the current one, but on a straight forward path or where there are no suitable objects on which to put blazes, this may not be the case. Blue blazes are used to mark the side trails. As well, plaques with the Thames Valley Trail symbol are posted every 1 to 2 km along the trail. Unfortunately, trail rerouting is frequently required. Details of the reroutes are published in the TVTA newsletter, on the TVTA website (see Trail Reroutes), and will also be made available in a form that can be inserted into the guidebook. If you encounter any trail problems, please notify a member of the TVTA Board of Directors. Every effort has been made to make the information in the Guidebook accurate. Any errors should be reported to the Guidebook Chairperson c/o Thames Valley Trail Association. Hikers are reminded that they hike along these trails at their own risk and that the Thames Valley Trail Association Inc. is not responsible for any injuries incurred, or loss of way.